Enjoy joining my English Setter named Dooper and me on one of our visits to the local hospital so you can see what a Therapy Dog visit looks like. Dooper loves doing his visits as much as people love seeing him. My dream is to have an army of Therapy Dogs out their spreading their love and joy in hospitals, churches, libraries, senior centers and many more places all across the land. Coming from the perspective of a dog trainer, dog parks are too risky. When people ask me about them, I suggest other ways to socialize and get quality dog playtime. If they really want to try one, I offer advice on ways to increase the odds for a safe experience for themselves and their dog. No one is there to police a dog park. No one controls who comes and goes. No one is there asking for proof of vaccinations or doing temperament test to see if all the dogs are healthy good-play partners. You don’t know what dogs are going to be there when you are. You have to wonder, are the other dogs properly vaccinated? Are the other dogs healthy with no contagious diseases? Are the other dogs dog-dog friendly? Are the other dogs dog-people friendly? I hear too many stories when these questions are given bad answers. Dog play can turn vicious quickly. It’s not uncommon for gang violence to erupt suddenly. Remember, dogs are pack animals and if two start something then others will most likely join. An innocent dog can be harmed especially if they are smaller than the others. Many parks don’t separate the small from large and the danger of a small dog being injured at some point is highly probable even if it is friendly play. Another problem is the people. Owners usually stand around chatting together clueless of what the dogs are doing. It’s rare to find someone who actively pays attention to the dogs. Even rarer is the person who prevents or stops when he witnesses things going bad. It might be that most people don’t have the skills to recognize when dog play is unsafe until it’s too late. What may look like play to others, from the eyes of a professional like me, may be serious over-arousal, dangerous prey drive, bullying and all out aggression in action. People get bit at dog parks. They get harassed by barking and lunging dogs. They may be the victim when trying to stop a fight. They may get knocked down by running dogs. Most certainly, I don’t recommend human kids go to a dog park; it’s too dangerous. A perfectly well behaved dog can learn some awfully bad behaviors at a dog park. All that money spent on training may be wasted. Here are some great ways to socialize and get your dog some good playtime. Does temperament testing so they know the dogs will play nicely. Requires proof of vaccinations so that you know the dogs are in good health. Is well staffed with a trained employee who watches as the dogs play, can recognize and has the tools and skills to stop when play is gets rowdy. The cost of a visit is well worth it because you are paying for peace-of-mind and a good play experience for your dog. Another idea is to do something that you and your dog do together! I know you’re tired when you get home from work or running the home, but nothing can relax you better than a good game of fetch, a run or a nice walk on a trail, or an agility run at a class or in your own backyard. Come join in one of our Super Dooper Dog Training classes. Find something fun and do it, together! Have a dog party at your house. Meet up with friends who have dogs that you and your dog like. You can swap out visits at each others homes. Have a cookout. Have a swim party. Go and watch the park at the time when you are likely to take your dog. Do this several days so you can see who comes and goes. Watch the people as closely as you watch the dogs. Look for a park that separates dogs by their size, offers a double-entrance so dogs can’t escape, is clean, offers shade and has water available though I advise you bring his water. And, if you do decide to try a dog park, I suggest you do these things. Watch your dog. Intervene quickly and safely if you see trouble-a-brewing. Protect yourself and protect your dog! It’s not being rude it’s being wise if you don’t stand around and chat with the other owners because your job is to watch your dog. Leave if you feel the least bit worried. Play it safe! If your dog isn’t having fun, seems worried and timid then leave. Don’t force him to play or be there. Practice call-to-come drills at least five times with your dog when he’s in the park but most importantly send him off to play again if he’s having fun. If you do this, he’ll come to you more willingly when its time to leave. Pick up after your dog goes poop. Keep treats or toys at home as they can trigger problems. Don’t stay too long as your dog may get overly tired and become grumpy and short-tempered around other dogs. Remember, your number one priority is the safety of you and your dog. In summary, I always recommend people to look for options besides dog parks. But, if you really want to try one, follow my advice and think of others yourself. Just remember, safety first! 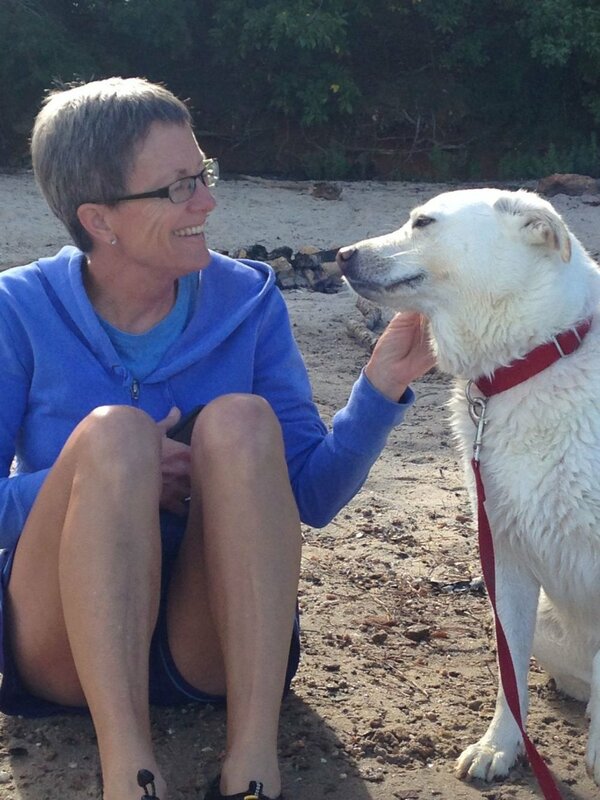 “Search for what naturally makes your dog smile.” Wise advice from one of my heroes, Sue Sternberg, an expert in the field of shelter dogs and their temperaments. Personally, it gets to the heart of how we should train and live with our dogs. It’s one of the reasons why we try to make classes fun and active. Dogs tend to trust and respect, listen and behave better for owners who make them smile. All dogs are different and have different likes. Our job is to find what naturally makes them happy. 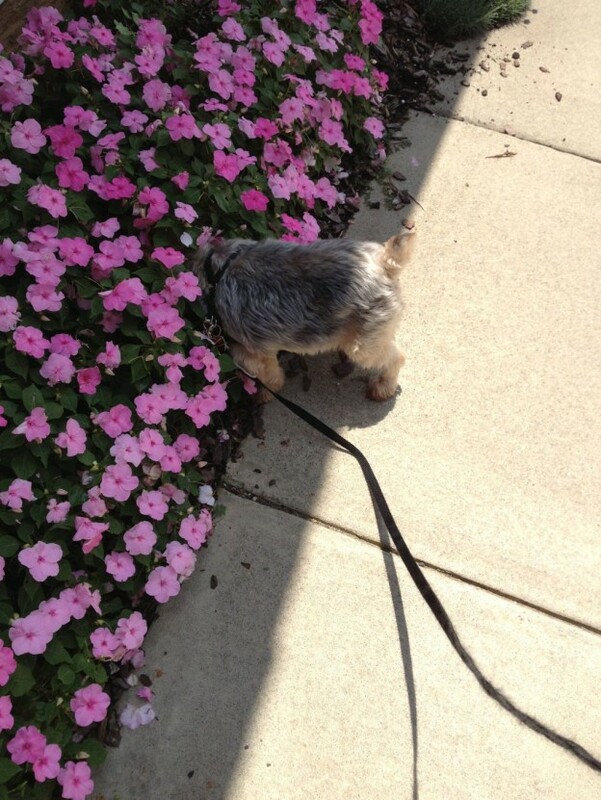 My parents’ Yorkie, Regis, loves to search in flowers for lizards. It’s his natural instinct in action. Our dog, Dooper, a Llewellin English Setter, loves to run and set on birds in open field since he’s a bird dog. When he was younger he loved fetch and do agility. One of my graduates, Sallie and her dog Gunter, a handsome German Shepherd Dog, absolutely loved to sniff the ground for all types of things. I recommended she do Nose-Work classes with him. She did and he loves it. She and I found something that used his natural interest. Dooley, Charlene’s (another student) Doodle, loves to cuddle with people and has become a wonderful therapy dog for TDI. Again, she pursued what makes him happy. The Mitchell family came for obedience classes and discovered when we started agility that their Cavalier, Colin, thrived on it. Based on our equipment, they built their own stuff and years later still have fun doing agility with him in their own backyard. We love when we discover what naturally “lights up” a dog. Activities like agility are transforming how we train. It creates a dog that wants to learn, wants to listen and wants to be with his owners. That’s why we teach it in all classes, even puppy class. Of course, we use low level equipment, tunnels and ramps since their bones and muscles are still in development. Agility is something you do with your dog so it helps build your relationship with him. You and he play together–that’s what we want. It’s easy to learn. Any size dog can do it because we can raise or lower equipment to match their size. Small dogs love it just as much as the big guys, as do mixed and pure breeds of all types. Any person can do it. In fact, some of the best handlers are kids. Agility teaches good manners commands because your dog will need to sit, stay, down, go-to-your-place, come and walk/run along side with you. As trainers, it gives us exciting ways to teach these sometimes boring but necessary obedience skills. Agility is a socially good time for you and your dog with other agility enthusiasts. It far beats a dog park in my opinion. It’s so much safer and again your dog is spending quality time playing with you. Or like Colin’s family, you can make your own stuff for your backyard. Pretty much anyone can do agility: young and old, fit or out-of-shape. You go at your own speed and pace. Agility can transform personalities. A timid shy dog builds confidence when he finally braves a ramp or tunnel that’s scared him earlier. The hyper overly-energetic dog learns to be calm and focus as he listens for instructions from his owner while running a course. Agility helps build your leadership as your dog learns to listen and look for your directions. In a way, you are the key to the door that opens a world of fun running and jumping, leaping and tunneling. Agility is just one possible option. The important message here is to find what your dog naturally loves to do and it will put a smile on your face, too. What's My Favorite Head Halter/Headcollar? There’s great news in the world of training equipment; things are changing for the better. What we commonly used a decade ago like “choke chains” are a thing of the past. New technology gives us new choices; now we reach for effective and friendlier products. The choices are vast. One of the options for equipment is commonly called a head halter or headcollar, I normally call them the former because it really functions just like a head halter for horses but they are made for dogs. There are different styles and bands but their job is the same- to gently control the dog. Myself and many veterinarians and fellow trainers and behaviorist like these as alternatives to collars that go around the neck. Here are some pluses to why we like head halters. Understand that a head halter is NOT a muzzle. A head halter allows a dog to eat, drink, walk, run, play fetch and yes, even bite. On the other hand, a muzzle is a protective device which covers the mouth so the dog can’t bite. There is a clear difference between a muzzle and a head halter. I carry two brands of head halters in my studio: the Gentle Leader Head Halter and the Halti headcollar. I like them equally. I think either brand works really well on most dogs. The Gentle Leader head halter is by Premier Pet Products and is made in America. It comes in two styles; the original and the Deluxe. The Deluxe can be hard to find as its usually only sold by trainers and behaviorist and online. The differences in the two are that the Deluxe has a soft felt cushion on the nose which makes it a little more comfortable than the original. It also comes in cute patterns and offers a matching leash. I carry and use both styles. You can find both brands online or in some stores but in my opinion; having a trainer like me helps when learning how to fit and use these products properly. Its really important that your dog feels comfortable and confident in his Halti or Gentle Leader. Thanks to TryNot Productions, we have a great educational video for you to watch at our website on the Gentle Leader. It gives a very good explanation and you see several different size dogs and their owners telling about how much they like the product. Go watch it, its short and well done. There’s great news in the world of training equipment; things are changing for the better. What we commonly used a decade ago like “choke chains” are a thing of the past. New research gives us new discovery, insight and new technology which ultimately gives us new choices; now we reach for effective and friendlier products. The choices are vast. Luckily, new harnesses are on the market and I love them! My favorite is the No-Pull Freedom Harness by Wiggles, Wags and Whiskers. Dooper’s been wearing one for over a year and I am totally sold on it. I’m not the only one who really likes this harness. It’s selected as one of the best recently in Whole Dog Journal, a bi-monthly periodical that I really respect. They are a little bit more expensive than others but I think they are definitely worth the few dollars more. I sell them to my clients at the Dooper Market at my studio where I can fit and show how to use it properly, but you can get it online. There are several reasons why I like this harness over others. First I think it’s a very simple harness to fit. If it’s simple for me to fit, then it’s simple for my students, too. This is important because in class, I don’t want to waste time. It comes in different sizes and strap thickness. And, I know my students can easily remember how to put it on because it’s so simple. Another reason, it’s a comfortable harness for the dogs. The belly strap is a soft, high quality felt strap so there’s rarely any chaffing. Other harnesses aren’t as soft and can cause rubbing and hair loss. The other straps of fabric, though they aren’t made of felt are soft yet strong. It’s incredibly durable as well. Dooper wears his all day long; on walks, during agility, therapy dog visits as well as running in the fields and swimming. To clean it, I usually hand wash his but I’m sure it will do fine in the washing machine I’ve just never have tried it. Fashion wise, they are great looking on the dogs. They offer many choices and all are two-colored; the martingale loops are a different color than the main straps so it makes it easier to remember how to put it on your dog. I seem to stay with the unisex colors like neon green/kelly green, orange/black, black/silver, red/blacks, navy blue/light blue but they have more feminine and masculine colors available. Most importantly, it’s effective and offers a unique feature of having two places where a leash can hook to it. There are two rings attached to martingale loops; one is on the chest and the other is on the back. Dooper does great with the leash hooked to the back ring; whereas other dogs do much better with the leash hooked to the chest ring. The beauty of the two rings is you can hook your leash to the back ring or the chest ring or both rings. You can buy their custom leash that has two bolt snaps; one at each end. I make my own using a carabiner. The final reason I like this harness is because for many therapy groups, it’s an approved harness. This is so important for my therapy dog clients because we can practice in the actual equipment they will wear during their therapy dog certification test. It’s the harness that Dooper wears during our weekly therapy dog visits. The only down side is that even though they make an X-Small size, it isn’t small enough for some of the smaller dogs like yorkies, shih tzus, and the like. For those smaller guys and gals, I have to find an alternative. That’s my only complaint. I give the No-Pull Freedom Harness by Wiggles, Wags and Whiskers an A+.